The concept of cleaning out a division is something that’s been discussed with several great champions during the course of UFC history. During Anderson Silva’s reign of terror over the middleweight division, he supposedly wiped out every viable contender several times over to the point where he was taking fights at 205 pounds just to have someone new to fight. Former welterweight champion Georges St-Pierre had a similar run during his career. In current era of the UFC, there are two fighters who are in the same category as Silva and St-Pierre in regard to dominating a division so thoroughly it makes everyone else seem pedestrian, despite the list of contenders actually being quite good. Ronda Rousey has systematically laid waste to everybody in the women’s bantamweight division to the point where she’s facing someone like Bethe Correia, who didn’t even beat a top-10 opponent before getting a title shot. Her upcoming opponent, Holly Holm, who is 2-0 in the UFC, will walk into her championship bout somewhere around a 15-to-1 underdog. Then there’s Demetrious “Mighty Mouse” Johnson, who once again throttled a top contender on Saturday night as he outstruck, outwrestled and outworked John Dodson for five rounds at UFC 191 en route to his seventh straight title defense. Johnson has mangled the competition at flyweight since moving down a division, after being a title contender at bantamweight despite being a much smaller fighter in pretty much every bout he took at 135 pounds. He went to a split decision with Joseph Benavidez to win the belt and then proceeded to knock him out cold in the first round of their rematch. Johnson made short work of John Moraga, Ali Bagautinov, Chris Cariaso and Kyoji Horiguchi without even really breaking a sweat. Dodson gave Johnson possibly his toughest fight at 125 pounds in their first affair and then proceeded to get shut out in the rematch. 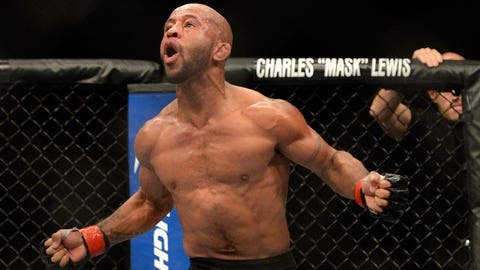 While Dodson clearly deserved another shot at Johnson, the fact that “Mighty Mouse” already had to face fighters ranked somewhere in the neighborhood of seven or eight in his division should have been proof he was already on his way to clearing out anybody and everybody that posed a potential threat to him more than a year ago. Other contenders like Ian McCall and John Lineker sabotaged themselves before they even get a chance to challenge Johnson in the Octagon. So what does Johnson do after another lopsided win in a fight that was billed as his toughest challenge to date? The only choice likely left in the division is Olympic gold medalist Henry Cejudo, if he can get past Jussier Formiga at UFC Fight Night in Monterrey, Mexico on Nov. 21. Cejudo certainly has the athletic résumé to promote in a fight against Johnson, considering he’s one of only a handful of Olympic gold medalists to ever compete in the UFC, but at 9-0 overall with three decision wins in the Octagon, is he really the answer? If Cejudo wins in November, he seems the most likely candidate to get the next shot, but realistically as gifted as he may be, he’s just not ready for someone like Johnson at this stage of his career. Cejudo could be a guy to give Johnson trouble a year from now when he’s downed a couple top-10 fighters. Following Johnson’s victory, UFC president Dana White promised a new challenger is waiting in the wings. "There’s always a contender," White said. "We are working on something right now and when it happens, you’ll agree." The biggest options for Johnson seem like fights at 135 pounds, but he’s already played that game. Prior to his reign as flyweight champion, Johnson fought at bantamweight extensively between the WEC and in his first fights in the UFC. Sure, the division has changed dramatically since Johnson challenged for the bantamweight title in 2011, but fighters always are getting bigger, stronger and faster and that never bodes well for a smaller competitor moving up a weight class. Add to that the fact that bantamweight champion T.J. Dillashaw has defended his belt only twice, and his biggest challenge lies in facing former 135-pound king Dominick Cruz or avenging his last loss against Raphael Assuncao. Dillashaw might enter the mythical pound-for-pound conversation one day, but he still needs to establish himself as the most dominant bantamweight in the UFC and that won’t happen by fighting a flyweight. The honest truth is Johnson really has cleaned out his entire division, almost exactly three years from the date he first won the belt in 2012. Johnson has beaten everybody put in front of him handily, and he’s dispatched his toughest challengers twice already on two occasions. Johnson is as good as advertised and it’s no promotional hyperbole to call him one of the best pound-for-pound fighters in the sport, and until a worthy contender emerges — and there aren’t any on the horizon in the flyweight division — he’s a champion with no equal. Honestly, right now there’s no one even close.